If you are a fan of Apple and have stayed tuned for every piece of news about Apple, you should know that the company no longer feature disc drives in its products. The last model of the MacBook Pro 15 that has a DVD drive was the mid 2012 model which Apple stopped selling in 2016. Users wouldn’t be able to watch a DVD movie without getting an external disc drive. To somehow compensate for the missing of the disc drive on its products, Apple sells its own external drive, but as you’d expect, it’s sort of expensive. Getting a disc drive which should’ve come with the product sounds like an unnecessary expense but you can actually do a lot of things with it other than using it to play your Blu-ray/DVD collection. Getting your DVD collection ripped and digitized, for one, is something you can do that will make watching DVD on your MacBook Pro a lot easier. If you enjoy watching movies, you can totally try getting your DVD collection digitized on your MacBook Pro. Check out what DVD ripper programs you can use to rip and digitize your DVD on MacBook Pro after getting a DVD drive. 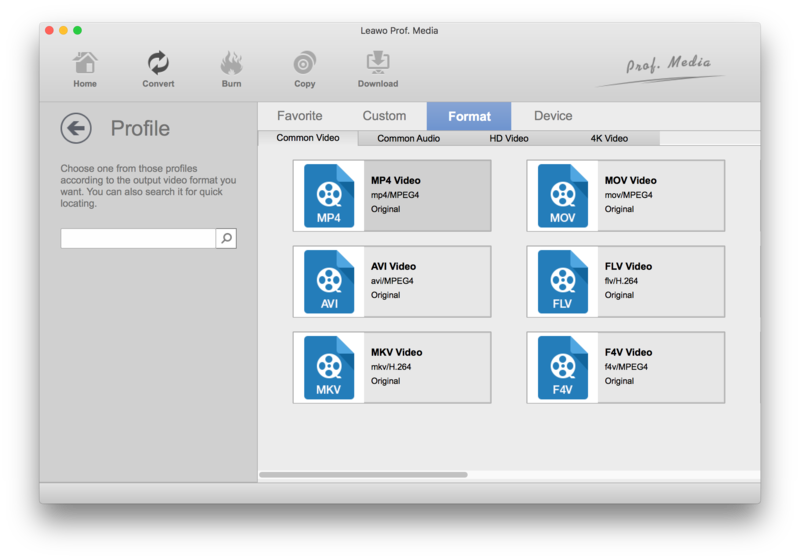 The first DVD ripper for MacBook Pro I’m recommending to you is Leawo DVD Ripper for Mac. There are a lot of reasons for it being the No.1 choice for DVD ripping on MacBook Pro. First, the program can now perform 1:1 lossless DVD ripping by converting the DVD content to MKV video losslessly. And you can keep all the subtitles and audio tracks in the MKV video if you need. But the large size of the lossless MKV video would probably cause storage shortage on your MacBook Pro. So there’s another option for you. And that is to compress the original movie and convert it to a common video file. That’s also something you can do with Leawo DVD Ripper for Mac, and it can do it well. It can compress the DVD movie with high quality. If you opt for a popular video format like MP4, you can even transfer the movie to your mobile handsets for direct playback on them. A one-year registration code for the program is $29.95 and the life-time license is $39.95. MakeMKV can rip Blu-ray and DVD to MKV losslessly and the DVD ripping feature is free. The main reason why it isn’t recommended as the first choice for a DVD Ripper for MacBook Pro is that it can only create lossless MKV videos, while the quality is on an absolute high level, the size of it would definitely cause problems. Its large size would take up a lot of storage space on your MacBook Pro. You’ll have to either delete some other stuff on your MacBook to make room for the movies or cut the number of movies you rip. But you can always use Handbrake to further process the MKV video and compress it to a smaller size MP4 video. Leawo DVD Ripper for Mac is the best DVD Ripper for MacBook Pro users who needs an all-round DVD ripper that can achieve different goals. 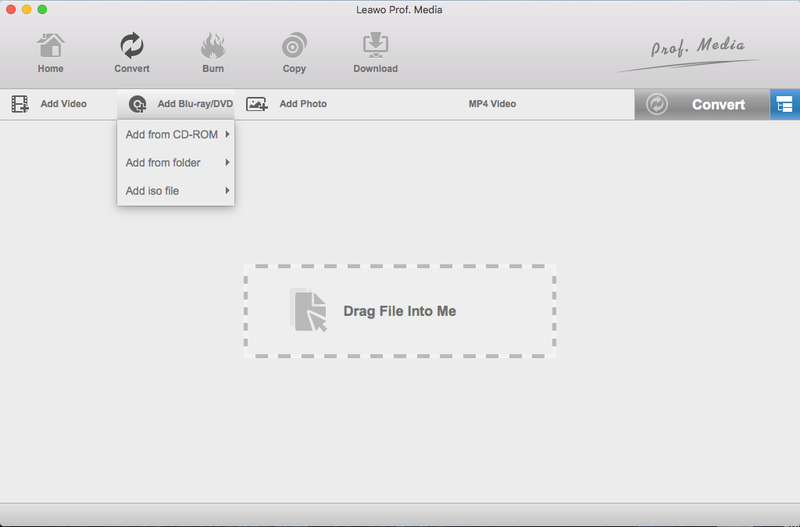 Leawo DVD Ripper can create a lossless digital copy of your DVD and if you need, it can also be used to rip DVD to play with iTunes or on electronic products you have like iPhone and iPad. To help you further familiarize yourself with the program, below I will show you how to rip DVD on MacBook Pro using Leawo DVD ripper for Mac. As a commonly applied strategy, many software companies would stuff some of its products in the same program. 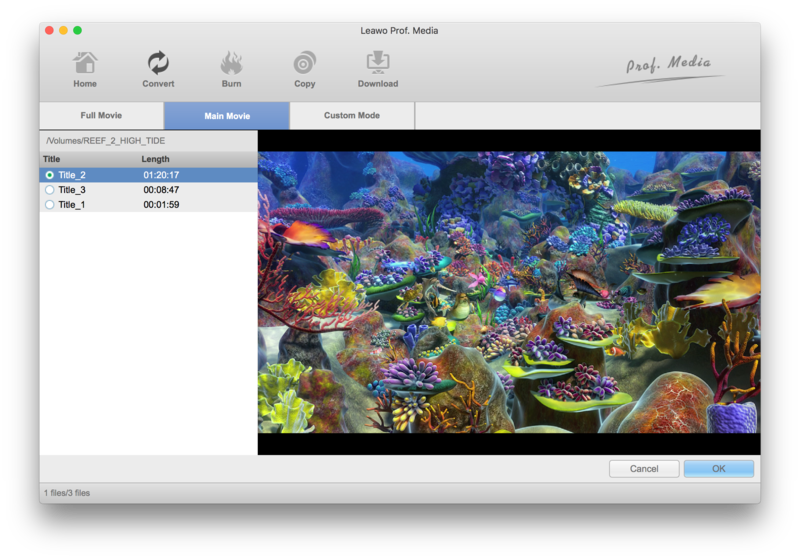 And Leawo Software also implemented this strategy by including Leawo DVD Ripper for Mac in its software suite called Prof.Media. So don’t be surprised when you have the program installed on your MacBook Pro and find that you installed didn’t DVD Ripper, note that you didn’t installed the wrong program. Before open the program, have the DVD disc you want to rip inserted into your DVD drive first. Step 1. Open Prof.Media. When the program is fully loaded on your MacBook Pro, you will see 8 different shortcuts representing 8 different programs that have been integrated into it. One of them is DVD Ripper. Find DVD Ripper from then and simply click on it to enter the main interface of the program. Step 2. You can load the content in the disc you put in the disc drive by clicking Add Blu-ray/DVD>Add from CD-ROM>[the name of your disc]. Or you can do the same by opening the DVD folder in the Finder app and dragging the folder to the interface of the program. Step 3. After waiting for a few seconds, the disc content will be added to a title list which lists all the video titles in the disc. There are 3 options here for you to choose the titles you need. You can not only rip all the titles by choosing Full Movie, but also rip titles you need by choosing them manually using Custom Mode. Also, the Main Movie mode would be able to help you quickly choose the main movie, which is longest video on the list, for outputting. Click the OK button to add the titles you chose to the video list. Step 4. Above the video list there’s a row of buttons. The button we need in this step is the second one from the right. It’s the Format button which tells you what the default format is. Click on this button and on the following menu that appears below it, click on the Change button. You will jump to the video format list where you can select an output format for the videos you’ve chosen to rip. When you find the format, directly click on it to make it chosen as the default format, and you will return to the video list simultaneously. There’s also a panel on which you can change the parameters of the format you just chose. If you want to get to that panel, click the Format button again and this time, click on the Edit button on the left side of the Change button. Step 5. There aren’t much left to do. Click on the Convert button next to the Format button. There will be a sidebar coming out from the right. The output path is on top of it. You can reset the output path if you need. Just click the button next to the output path box to select a new location for the output video and click the Convert button on the sidebar to start ripping the DVD to your MacBook Pro. Getting your DVD collection ripped and digitized is like creating a backup of the disc. If your disc gets damaged, you will still have the digitized video of it.